Winter is usually about soups, curries, stews and other hearty dishes, but sometimes you just need something a little more colourful. Rice paper rolls are the ultimate summer dish, but no longer are they banished to hot weather alone. The great thing about rice paper rolls is how versatile they are – you can pretty much make them with whatever you have on hand. As a result, each time I make them they are slightly different. While I’ve only included veggies in these ones, I often add a strip of marinated tofu or tempeh to each roll, or even some edamame beans or avocado (though I haven’t tried avo in the baked version). When I am making fresh rice paper rolls, I always tend to separate out each ingredient and place them neatly in the rolls, but with these I’ve just mixed all the bits up in a bowl and chucked them in – perhaps more reminiscent of a spring roll filling. Easy as bro. Like the filling, the dipping sauce I use varies each time – sometimes I just grab some sweet chili or rice wine vinegar and soy straight from the bottles, or sometimes I feel inspired to whip something up especially. I initially intended to do a peanut dipping sauce, but after finding there was no peanut butter (sacrilege!) I improvised with cashews and sesame oil, which had quite a similar effect. I did have a go at pan frying these dudes, and then tried baking them – while they were both good, I preferred the texture of the baked ones which seemed to get a little crispier while still retaining some chewiness, as well as being less oily. Preheat oven to 180C, and line two baking trays with paper. Place vermicelli noodles in a bowl, and cover with warm water. Set aside. In a large bowl, mix together cabbages, spring onions, carrot, mint, coriander and bean sprouts. When noodles are tender, drain them and using kitchen scissors, roughly chop them so they become smaller pieces. Add to the bowl with the veggies. In a small bowl, mix together chili, rice wine vinegar and soy sauce. Pour over the veggie mix. Now prepare a large bowl with warm water to dip the rice paper sheets in. One at a time, lay out the sheets, place filling in the centre and roll up, folding the sides in first then rolling away from yourself. If you aren’t familiar with how to wrap rice paper rolls, jump on youtube and do a quick search. Lay rice paper rolls down on the prepared trays, then spray or brush with olive oil. Bake for 15 minutes, then flip them and bake for another 10-15. To make the dipping sauce, place all ingredients in a blender or food processor and blend until smooth. If too thick, keep adding water one tablespoon at a time until you reach the desired consistency. 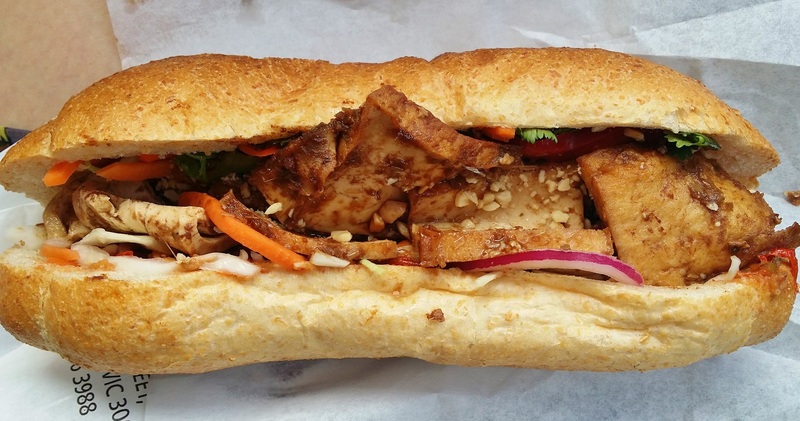 Ever since I was alerted to the fact that there was a new Vietnamese place on Smith St serving vegan bahn mi’s by Cindy and Michael of Where’s the Beef, I have been an eager regular of Trang Bakery. Being quite north of Johnston st, Trang is a little out of the way of the regular hubbub of Smith St, however it doesn’t stop them attracting a line out the door each lunch time, and going the extra distance is definitely worth it. 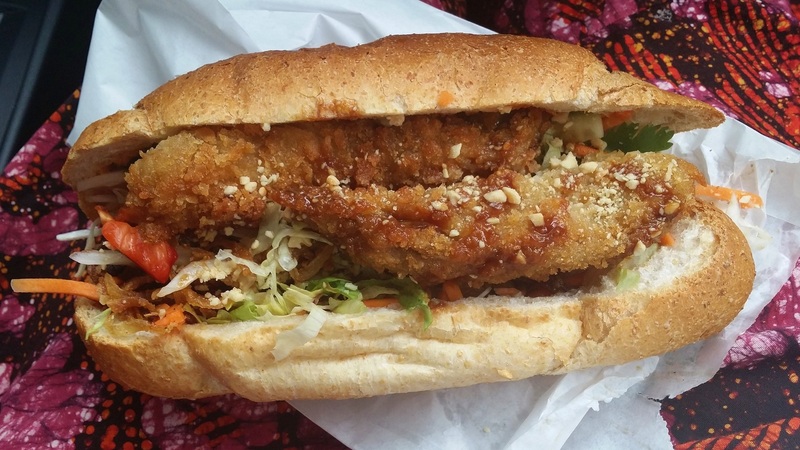 With a huge range of vegan options including mock duck, chicken, fish, pork, lemongrass tofu, tempura eggplant, chicken burger, prawn (and possibly more), they really are my new best friend. At $5 (or $5.50 for eggplant) they are a great cheap and filling eat. Eggplant is my most commonly ordered – especially since they have changed the way they’ve cut the eggplant to better fit the roll. I guess it’s probably my favourite as I always feel a pang of disappointment if I get there later in the day and there’s no eggplant in the tray. This is the lemongrass tofu – it’s between this and duck for my second place. You have the option of peanuts and chili (yes and hell yes), wholemeal of white bread, and an array of fresh veggies. They also put some kind of paste on the bottom – Michael and Cindy describe it as a roasted eggplant relish, and some special sauce and shallots on top. Heaven! This is the last one I have a decent photo of – I think it is the roast chicken, but could be duck – I can’t remember. I haven’t forayed into the seafood options as have never been a fan of real or mock seafood – too fishy (unless you batter some tofu, deep fry it and call it fish a la Cornish Arms) so can’t vouch for them, but I’ve enjoyed everything I’ve had here. 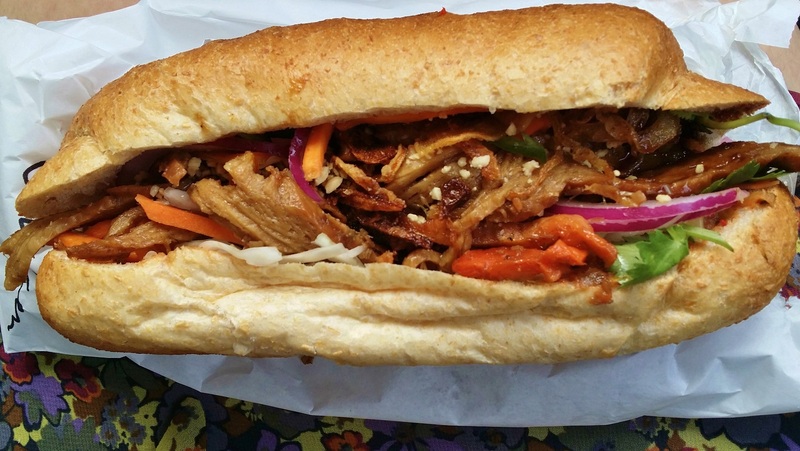 There are also some donuts and sweets that I’ve just discovered are vegan (though haven’t tried) and they have other options like noodles and rice paper rolls, however I can never resist the bahn mi. Trang have expanded and opened up a second shop in Hardware lane in the CBD. Let’s hear it for our vegan-friendly friends!